Born in 1970 in the city of Leonberg, land Baden-Württemberg, Germany, Natalia Haszler started her professional career in 1986. She studied organ with the well-known German cantor Johannes Mayr in Stuttgart, Germany, followed in 1991 by composition studies with the famous professor V.A. Uspensky at the St. Petersburg State Conservatory named after N.A. Rimsky-Korsakov in Russia. She graduated in 1997, and was granted the academic degree - Magister of Arts. Having continued with musical arts doctorate studies, she was awarded the academic degree of Doctor of Musical Arts in 2000. Her work was performed in 2000 at the Festival - Splendeurs de la Musique Russe in France, 2004 at the Easter Festival in St. Petersburg, 2011 at the International Contemporary Music Festival - Moscow Autumn in Moscow, and 2012 at the Valery Gergiev’s Moscow Easter Festival performed by the Moscow Patriarch Choir of Christ the Saviour Cathedral under the direction of Dr. Ilya Tolkachev. In 2008 she was awarded the 1st Prize of the All-Russian Composer’s Competition named after Andrey Petrov in St. Petersburg, in the category “Symphonic Music”, the “Public’s Choice Award”, and the “Intercultural Cooperation Award” for her vocal-symphonic suite “Instants d’Amour”. In 2010 she was awarded the 1st Prize of the All-Russian Composer’s Competition “Russian Choir Music of the 21st Century for the Youth, St. Petersburg, in the category “Tradition of the Orthodox Liturgy” for her works “The Creed”, and “Sticheron to the Blessed Xenia of Saint Petersburg”. In 2011 she was awarded the 2nd Prize of the All-Russian Churchcomposer’s Competition “300-years of the Holy Trinity Alexander Nevsky Lavra” in St. Petersburg, in the category “Tradition of the Orthodox Liturgy” for her work “Sacred Concerto to the Saint Xenia of Saint Petersburg”. Natalia Haszler is the author of various vocal and instrumental works in the genre of symphonic and chamber music, which are performed worldwide. Her liturgical choirs are a key component of the Divine Liturgy of the Orthodox churches both in Russia and abroad. Member of the St. Petersburg Composers’ Union and the Philharmonic Society, Russia. 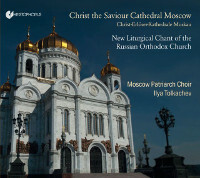 The first CD of the Moscow Patriarch Choir of Christ the Saviour Cathedral presents new liturgical and concert compositions composed by Natalia Haszler and the choral director Dr. Ilya Tolkachev. These draw upon the long tradition of liturgical choral works of the Russian Church, leading us into the world of classical Russian sacred chants with powerful chords and dark basses. However, the tradition is scrupulously expanded through new sounds and chord formations, adding new touches of colours. 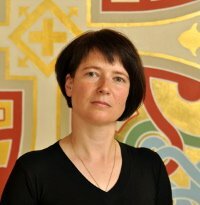 With the compositions of the German Natalia Haszler - for the first time - the Russian Orthodox Church is opening itself to works, now being performed in the liturgy, by a woman composer who is not from Russia. & ©2014 Published by Note 1 Music GmbH Germany & Naxos of America. Manufactured and distributed by Christophorus Records in Germany. Recorded at the Cathedral of Christ the Saviour in Moscow, Russia. 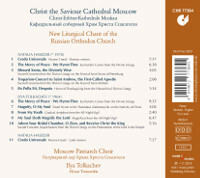 The CD is available at the Cathedral of Christ the Saviour in Moscow and on Amazon.